The last day of RIPE 76 saw 737 attendees checked in with a total of 778 registered, making it by far our biggest meeting yet! 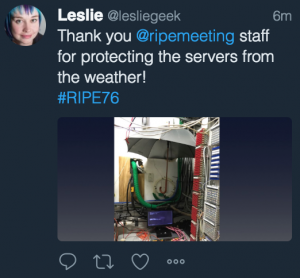 An update from the RIPE Meeting technical team covering new APs, new methods for graphing network usage at the meeting and one server lost to the rain! 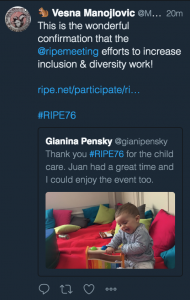 The closing remarks from the RIPE Chair thanking attendees for making their way to RIPE 76, and a special thank you to the WG co-Chairs, the PC, and of course, the stenographers. RIPE Networking App (totals for the week): 391 participants; 890 messages; 1383 meetings! The 2018 Rob Blokzijl Award winner was announced at the RIPE Dinner on Thursday night. Congratulations to Wilfried Woeber, who was awarded for his substantial contributions to the development of the Internet in the RIPE NCC service region.